Here's the top of the Bricks in the Barnyard pattern by Bonnie Hunter. I tried to chain piece the blocks but found I really needed to constantly to double check the blocks to make certain they were facing the correct direction. It really helped to follow her suggestion to start piecing the blocks from the center of the quilt. I still had to do a bit of un-sewing! If you make this pattern, assemble it when you are feeling fresh and alert. It's really easy to accidentally flip a block and it is possible to get 2 rows that look right together but don't fit in the quilt! There is actually a mistake in the diagram showing how to construction this quilt in Bonnie's book, Scraps & Shirttails II. One block, 2nd from the right in the row just below the horizontal midline, has been flipped. 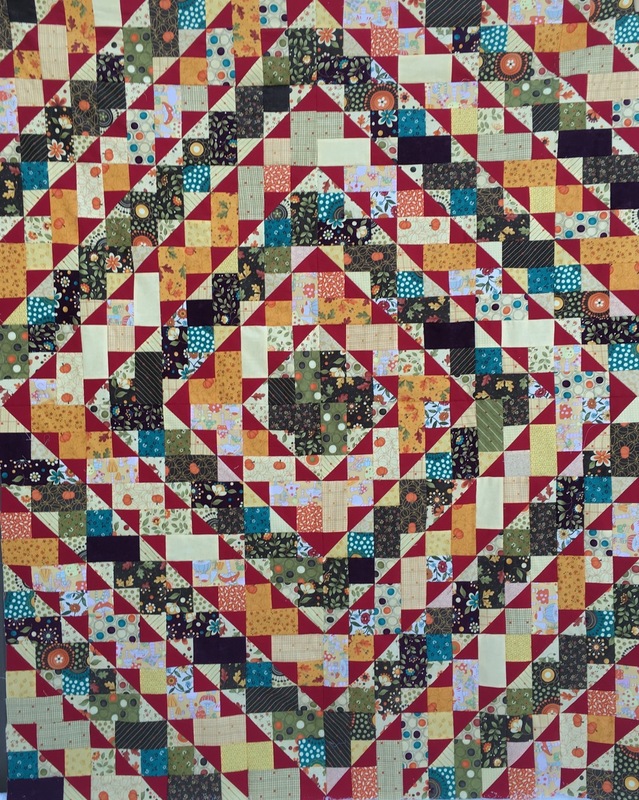 The points of the red triangles are facing the center of the quilt and they should be facing away from the center. The actual quilt in the book is fine, only the diagram has the error. Bonnie pieced a braid for the border on her quilt. I decided I want I smaller quilt, so I'm going to use a border of solid red. I'll show you my Bricks in the Barnyard quilt again when it's finished. I've been working on a couple other projects, so it will probably be a few weeks before I complete this quilt.